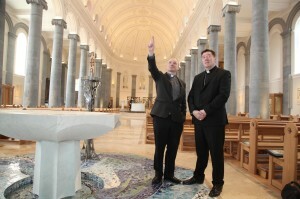 St Mel’s Cathedral in Longford following the completion of the restoration project. Pic John McElroy. This is a story of transformation from a shell to the beautiful and elegant sacred place we have today, Bishop Francis Duffy said on Friday ahead of today’s official re-opening of St Mel’s Cathedral for the first time since it was destroyed by fire on Christmas Day 2009. Addressing the media, Bishop Duffy paid tribute to his predecessor, Bishop Colm O’Reilly, who the midst of the ashes, flames and dilapidation said St Mel’s would be rebuilt. “That was the voice of leadership,” Bishop Duffy said and added that he wanted to thank Bishop O’Reilly for his vision and determination. According to Bishop Duffy, who was only appointed to the diocese about a year ago, that throughout the diocese there was a great sense of loss and a great fondness for ‘our Cathedral’. 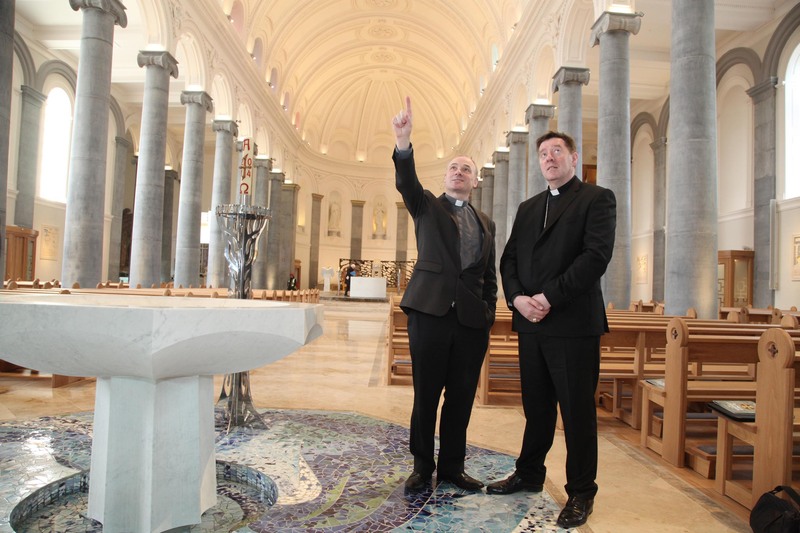 In a forthcoming RTE documentary, which will be broadcast on 30 December, Bishop O’Reilly tells Ciaran Mulooly that he would like to see the new cathedral become a symbol for renewal of the Church in Ireland. The two bishops also announced on Friday that St Mel’s will be rededicated on Sunday 17 May 2015, which is the closest Sunday to 19 May – the anniversary of the original dedication of the cathedral in 1840. Bishop Duffy told CatholicIreland.net that when the people of Longford come back to St Mel’s “they will certainly see the familiar St Mel’s. As they come in, it is welcoming, open and warm. There is a sense of intimacy in this building,” he said of the reordering which has seen the altar moved forward and less seating with a large baptismal font. Asked about seeing St Mel’s as a symbol of renewal in the Irish Church, Bishop Duffy said there was a sense of tradition and yet when people came inside the cathedral they would see the new elements. Contrasting the highs and lows of 2010, Bishop O’Reilly said with hindsight, the bank bailout could be seen as a low, whereas the decision to restore St Mel’s had been a high, despite the tragic circumstances of its destruction. 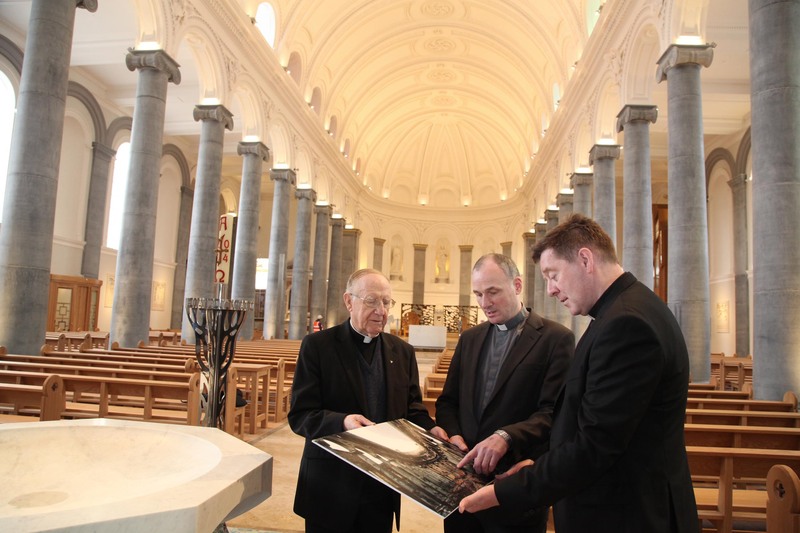 Bishop Emeritus Colm O’Reilly, Fr Tom Healy Administrator of St Mel’s Cathedral and Bishop Francis Duffy, Bishop of Ardagh and Clonmacnois looking at a photograph of the fire damaged Cathedral during the press viewing on Friday. Pic John McElroy. In 2009, Bishop O’Reilly had described the shock at the level of destruction caused by the fire as “like a dagger in the heart of the diocesan family”. He said the past five years had been “a long hard interesting journey with many twists and turns”. Fr Healy said that the absence of St Mel’s over the past five years had been felt badly. “Many said the heart was gone out of the town”. But that there had been a palpable air of excitement in Longford for the past while and everybody seemed to be talking about the reopening. 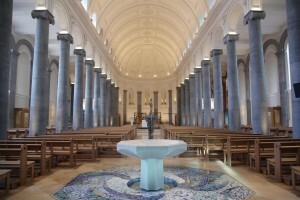 The reconstruction of St Mel’s cost €30 million of which €7.5 million was paid to the Revenue. 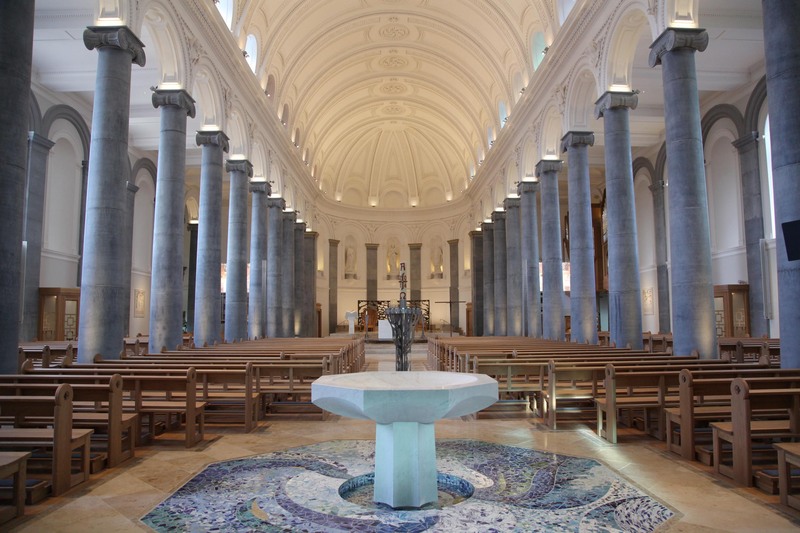 According to the Chairman of St Mel’s Cathedral Project Committee, Seamus Butler, the restoration project received just €100,000 of tax payers’ money in a grant from the Heritage Council. An average of 100 people worked on the site every day and it is estimated that for every on-site job, an off-site job was created. The restoration project also created two training courses for 60 people, one of which upskilled local tradespeople in heritage restoration. In his address, Colm Redmond, the lead architect on the cathedral project, remarked “It is my hope that the people of the Diocese of Ardagh and Clonmacnois will embrace their cathedral as the return of an old friend, as they recognise in the building features they have known for many years, while welcoming the new intervention as part of a new phase of life of the cathedral,” he said. The rebuilt cathedral incorporates a new 2,300 pipe organ which was made by the Fratelli Ruffatti of Padua. All 28 limestone columns supporting the structure were so severely damaged by the 2009 fire that they had to be replaced. In November 2011, a time capsule was discovered within the Statue of the Sacred Heart which contained paperwork which is believed to have contained the names of the children from the 1890s in the diocese who had contributed their pennies towards the purchase of the Sacred Heart statue. The new artwork in the cathedral incorporates works by ten contemporary artists, five men and five women, including Imogen Stuart and Korean priest Fr Kim En Yoong who made the stained glass windows along one side of the cathedral. The Stations of the Cross are still be completed by sculptor Ken Thompson. The altar is made of a single block of Carrara marble, the same marble from which ‘David’ was sculpted by Michelangelo. Two Harry Clarke stained glass windows have been repaired by Abbey Stained Glass in Dublin and have been returned to their old positions. A museum is planned for the crypt which will tell the story of St Mel’s and it is hoped it will also display some of the 25,000 images taken by Tiernan Dolan since Christmas 2009 of the restoration work of architects, craftsmen and artists will be displayed. Those more comfortable with their TV sets, the live stream is available on the local Longford town cable TV station – http://www.crossan.ie/index.php/cable-television-overview/ or through a Set Top Box supplied by Church Services TV (CSTV).